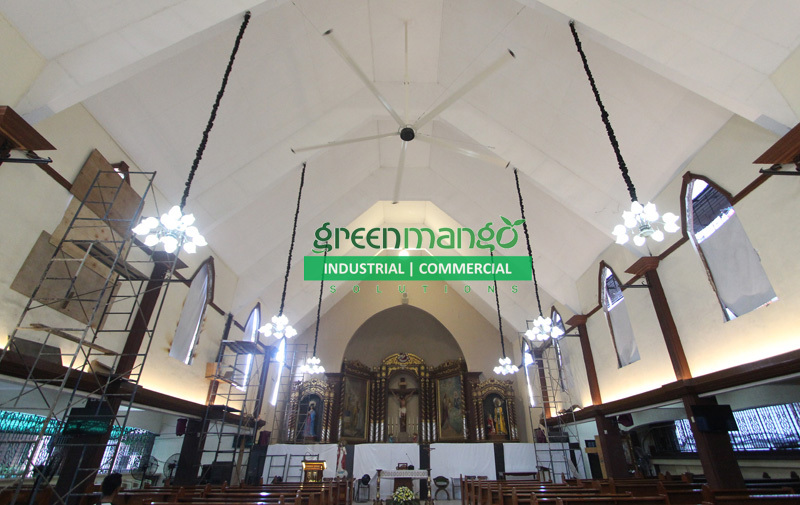 GreenMango provides solutions to industrial and commercial needs ranging from 16- to 24- feet High Volume Low Speed (HVLS) Fans, Umbrella-Type HVLS Fans, Mounted HVLS Fans to Movable HVLS Fans. 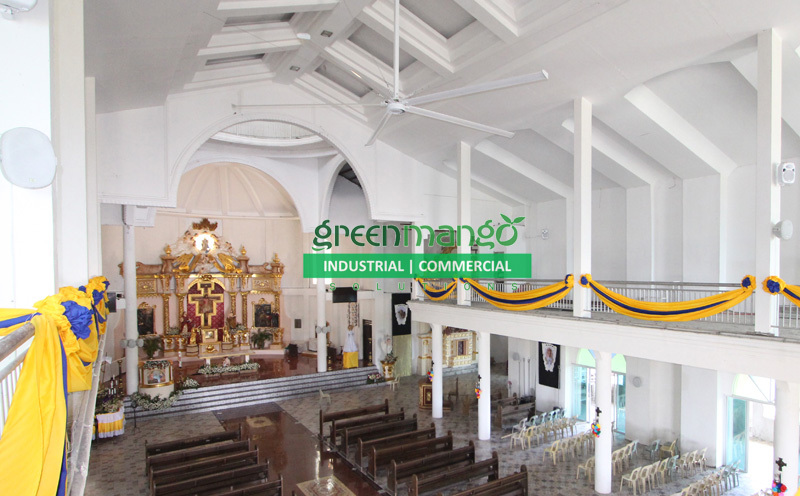 Unlike others, GreenMango Solutions uses the latest PMSM motor technology revolutionizing the HVLS Fans industry. 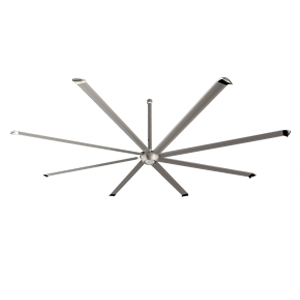 Zephyr is the premium 5-blade HVLS fan series that is designed for superior wind speed performance and efficiency that leads to high energy savings. 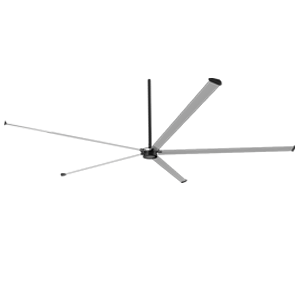 Zephyr is powered by a new revolutionary Permanent Magnet Synchronous Motor (PMSM). Zephyr comes in three sizes 18 ft, 20ft and 24 ft. Zephyr is the choice for bigger spaces with higher ventilation requirements. Similar to Vento, Zephyr is perfect for sports, recreation, entertainment, traffic hubs, commercial and even industrial uses. 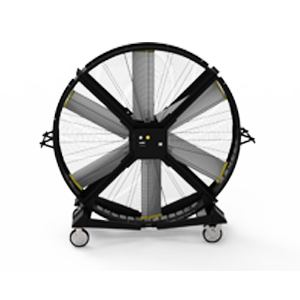 Vento is simple 5-blade HVLS fans that comes in two sizes, 22 and 16 feet. 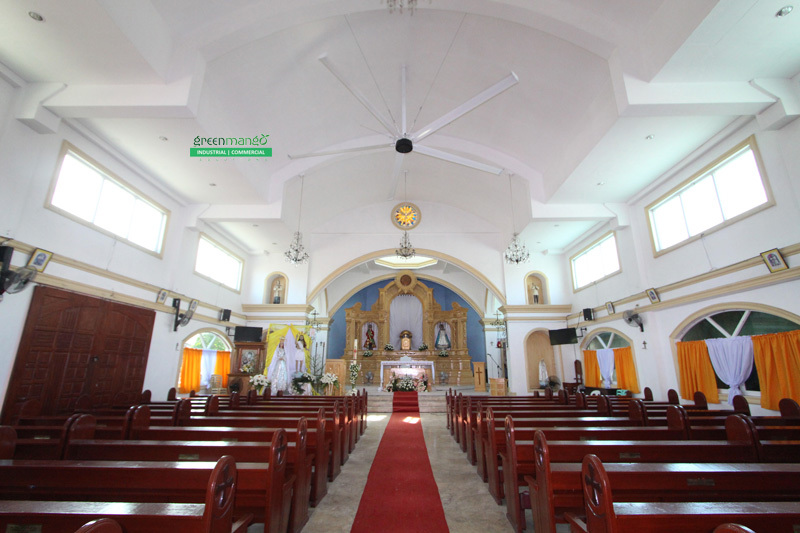 Vento is best for commercial spaces that demands comfort and wind speed. It’s suited for sports (fitness clubs, gym/athletic training stadium), recreation & entertainment (amusement park, zoos, children’s playground), traffic hubs (airport, railway station, and bus station), commercial place (function center, shops, restaurants, supermarkets), others (warehouses, factories, museums, and outdoor venues). 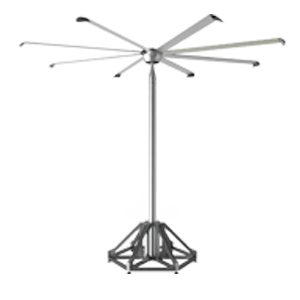 Brisa is an 8-blade 14-ft HVLS fan with seamed edge design with fluorocarbon paint technology. The fan blade tail is meteor-inspired that when the fan is turned on the tail will result in a gorgeously beautiful silhouette. The unique middle cover hides the intersection of the shell and fan blade, making the design even more luxurious adaptive to all design and structures. Similar to Vento, Brisa is perfect for sports, recreation, entertainment, traffic hubs, commercial and even industrial uses. 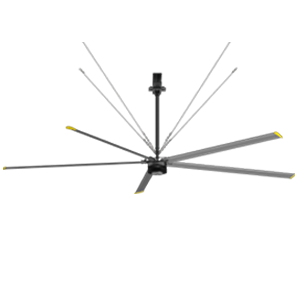 Gale is specifically designed like an umbrella where fans can’t be installed on ceilings. Gale can be installed with billboards, lightings, fences or even benches. Gust is a a large fan with air volume comparable to 20 units of industrial fans. Gale fans can be installed on tight or complicated places including walls, beams and posts. Xana is a 2 meter movable fan that has 4 wheels with a durable steel frame. Xana can be moved anywhere despite its size. Its strong durable frame is rust and water proof. 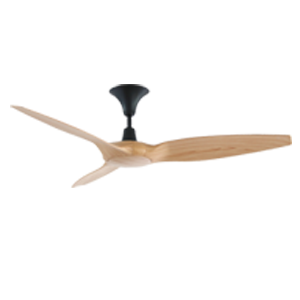 Kaze fan series is especially made for residential purposes. Kaze fan makes you feel the natural breeze right at our own home. It's perfect for comfortable homes for families. 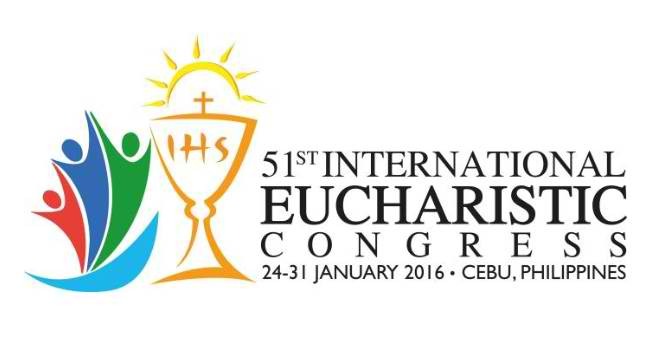 We are the Official Partner of the 51st International Eucharistic Congress. 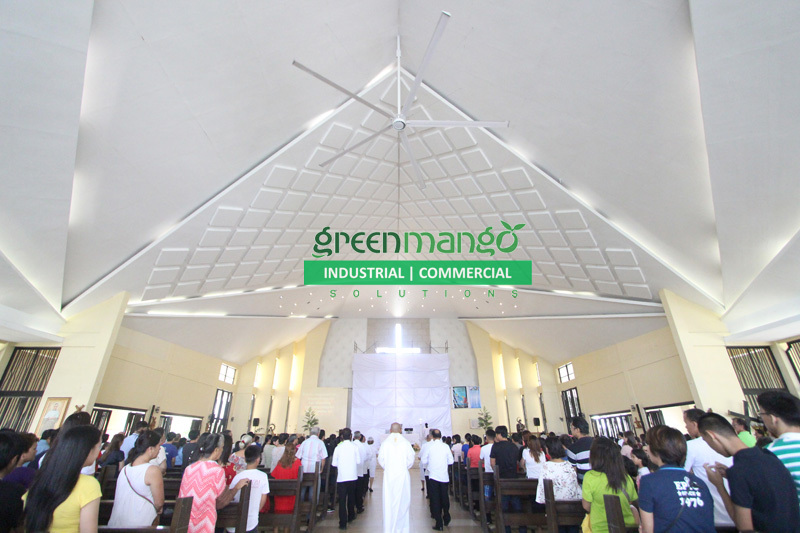 We made sure that this milestone event attended by faithful and clergy from across the globe was comfortable because of our GreenMango HVLS Fans. 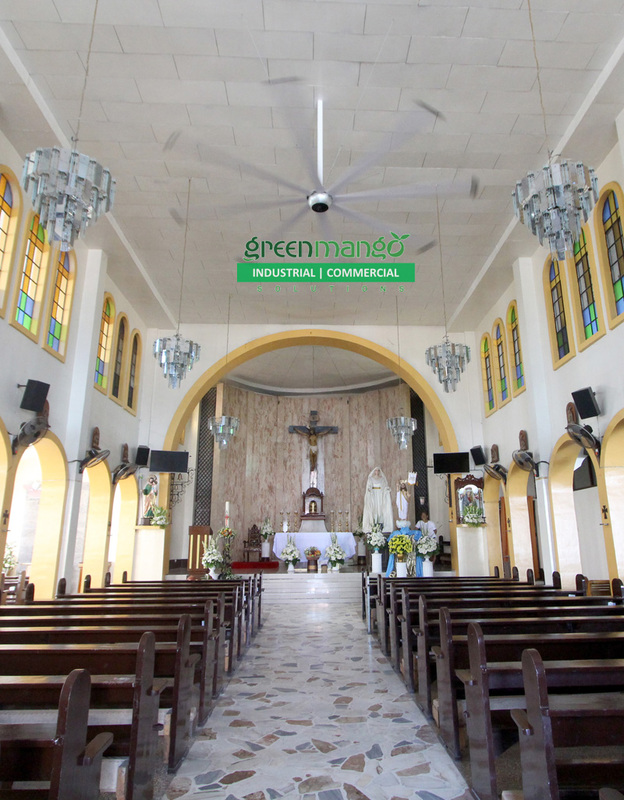 GreenMango HVLS fans uses permanent magnet synchronous motor technology different from most HVLS Fans. 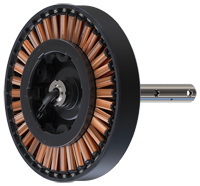 Compared with traditional geared motor, PMSM (Permanent Magnet Synchronous Motor) has lots of great advantages, such as high efficiency, long-life, low noise, free maintenance and wide range of speeds.Those advantages make PMSM have a wide range of applications in any field whether industrial, commercial and even in aerospace. 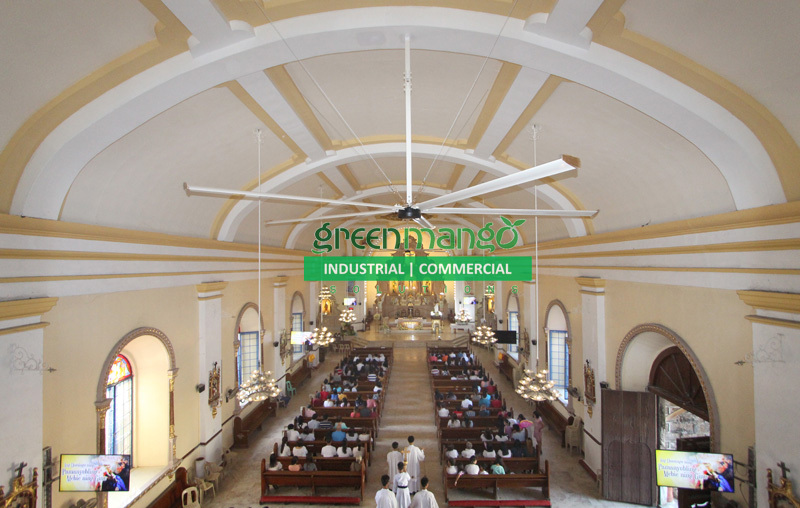 GreenMango Solution HVLS Fans use PMSM driving motor making it the more advanced in HVLS industry. 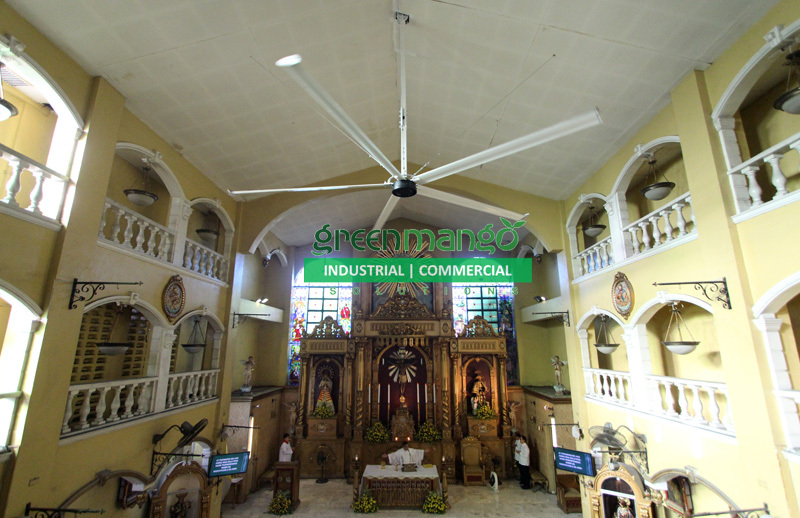 GreenMango HVLS Industrial fans combines a series of comprehensive and advanced technologies such as aerodynamics, transmission mechanics, PMW control. GreenMango Solutions team solved the challenge of large torque and low speed in HVLS industry. With the PMSM technology, GreenMango Solutions have reached international highest level certifications as evaluated by international Japanese and Australian standards. In most large spaces, it’s very difficult to control heat. Heated air moves up- ward and form hot air layer that will cause the temperature to increase 1-2°C for every 1m in height. This issues in heat, and in some cases ventilation, means serious risks ranging from energy costs. More importantly, not being able to manage the temperature means decrease in productivity for workers and comfort. However, Green Mango Solutions solves this problem through high volume fans run at a low speed. It pushes the heat down removing the hot air layer. This natural wind solution also have added bonus. It helps anyone save more than 30% energy. Increase in productivity and increase in savings leading to more income for businesses. 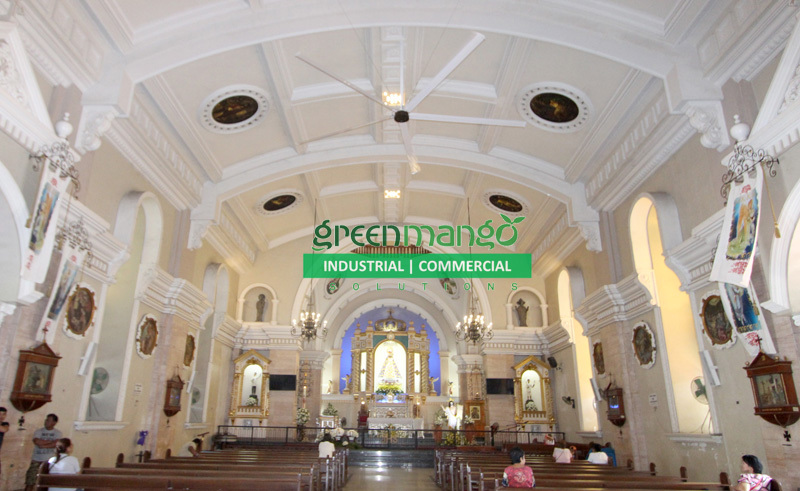 Green Mango Solution Fans accelerates air mixture in the large spaces by removing and dispersing smelly air and moisture to improve air quality and en- joy a healthy and safe working environment. At the same time, the solution also can avoid damages to equipment due to moisture and ventilation issues. 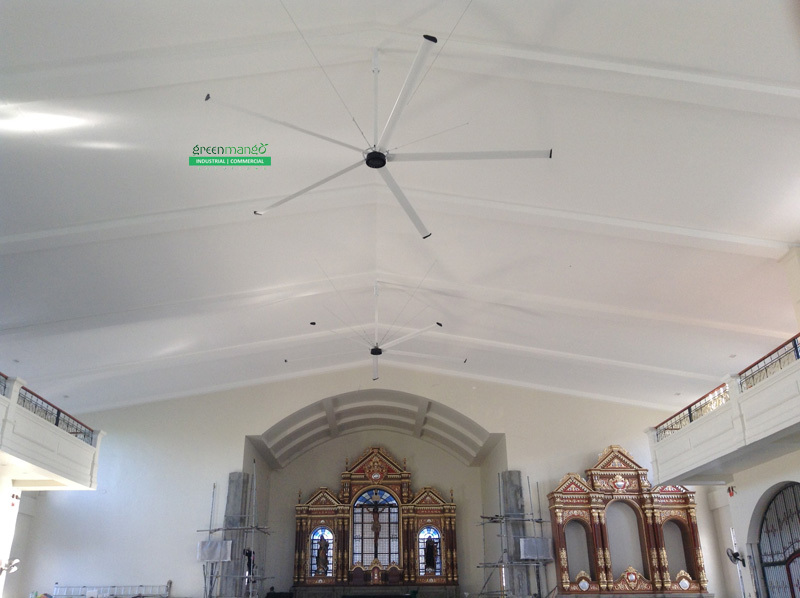 GreenMango HVLS Fan PMSM is only 0.3M, the whole weight is less than 80KG, reducing the load-bearing. GreenMango Fans adopts PMSM motor, combines industrial design and interior aesthetics adapting to modern and traditional structural designs. 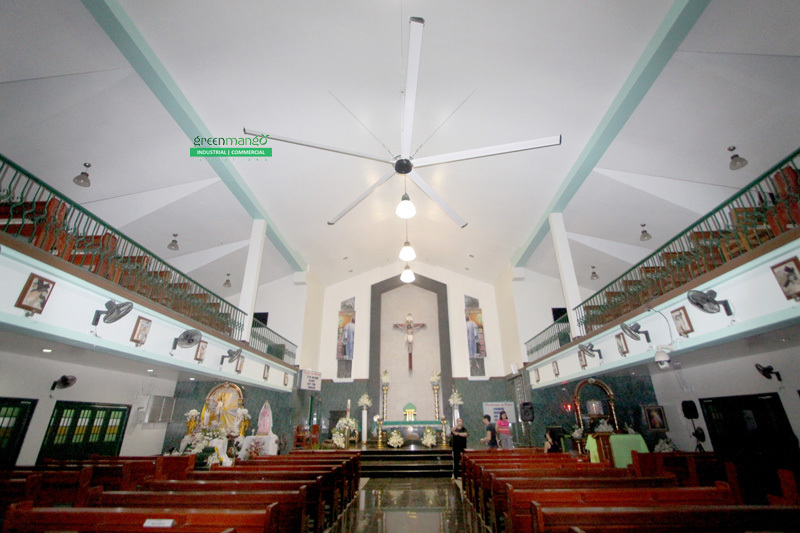 The color matches the ceiling design making the GreenMango HVLS Fans adaptive to all ceiling types. 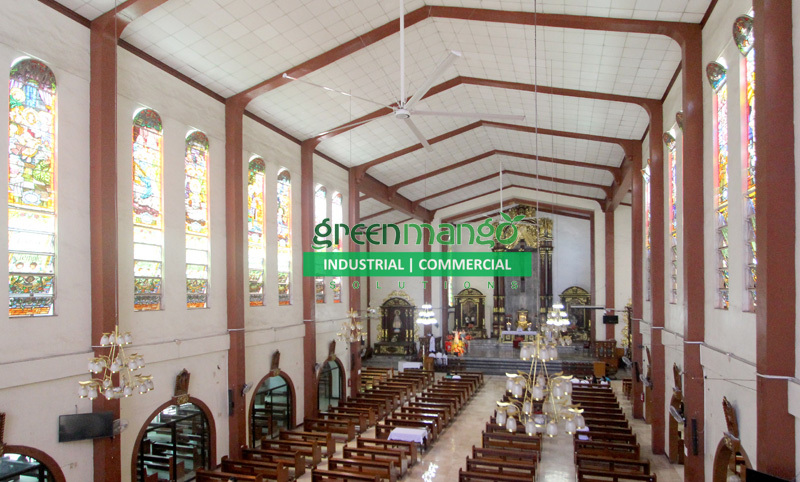 GreenMango Solutions HVLS Fans uses PMSM motor, electromagnetic interaction, bearing transmission, making it totally free maintenance. PMSM motor saves more 10-15% than traditional asynchronous motor. PMSM has unique large outer rotor torque design, eliminating friction energy consumption on its gearbox, resulting to 5-8%, savings. 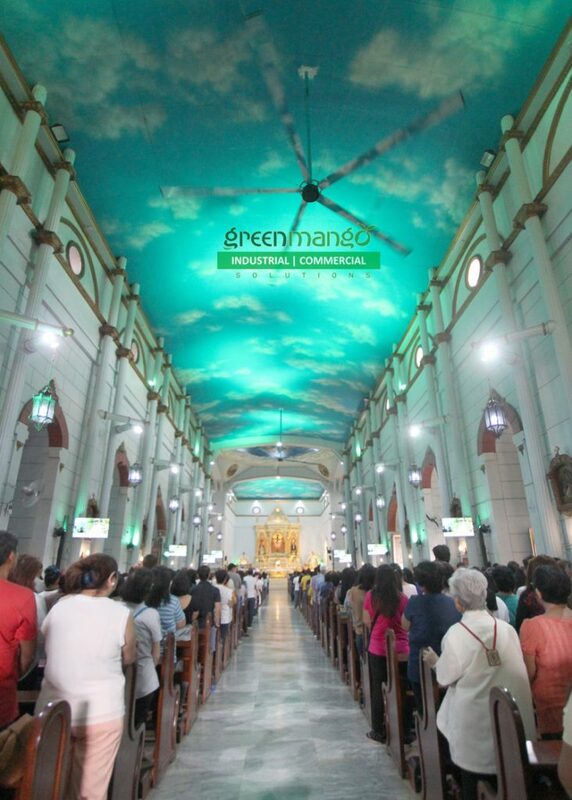 The use of PMSM solves the noise problem perfectly, making GreenMango HVLS Fans noise level within 40DB. 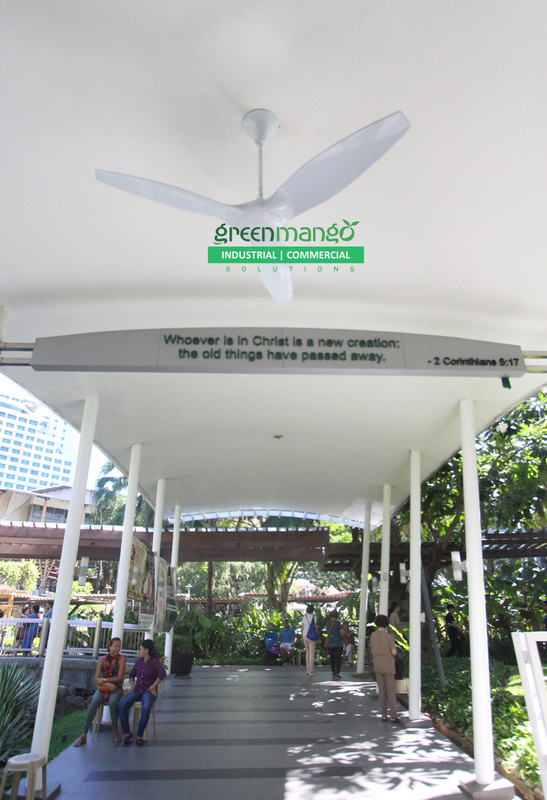 GreenMango HVLS emulates not only the strength of natural breeze, but also the nature-like experience of natural wind. Anyone would feel like they are in the provinces, beach, mountain or in the farm. The PMSM paired with a better blade design result in as much as 447,100 FT3/MIN The large diameter increases airflow and low speed decreases airflow resistance, resulting in large air volume circulating. 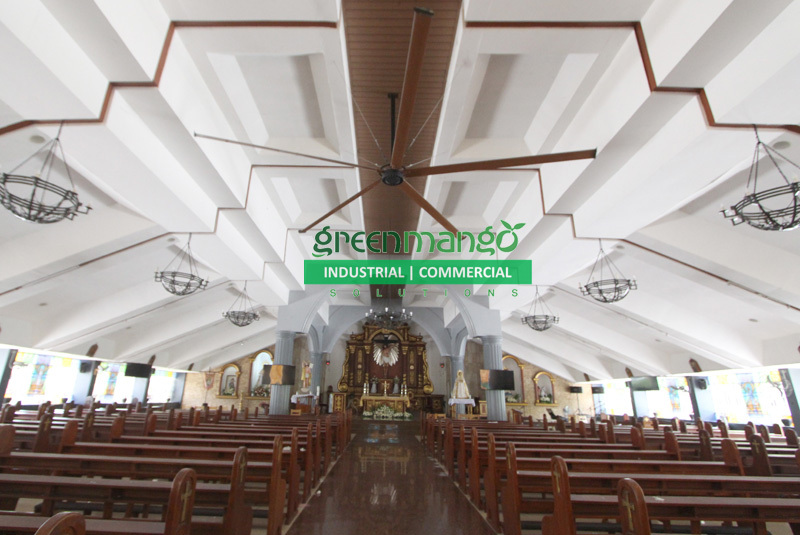 GreenMango HVLS Fans that uses the External Jacketed Connector is a blend of aesthetics and functionality coupled with utmost safety. It look hip and more sturdy than the common insert type connector. 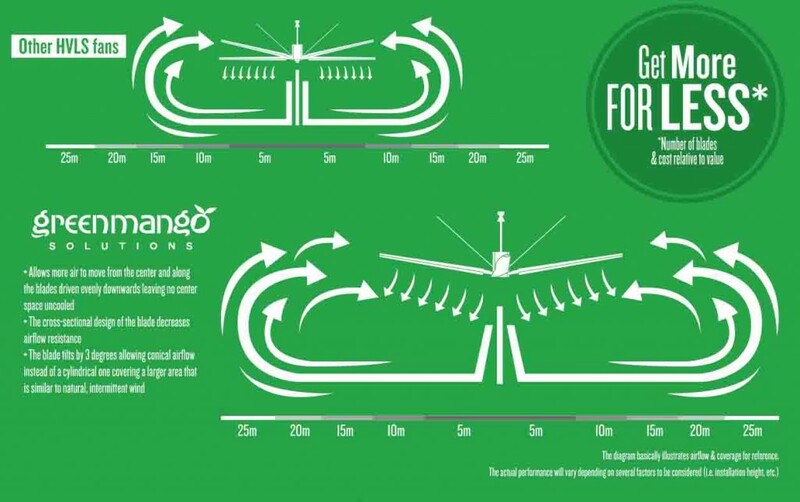 The GreenMango HVLS Fans External Jacketed Connector enables equal distribution of force stress. This setup effectively control all kinds of problems caused by force concentration on fan blade and bolts. 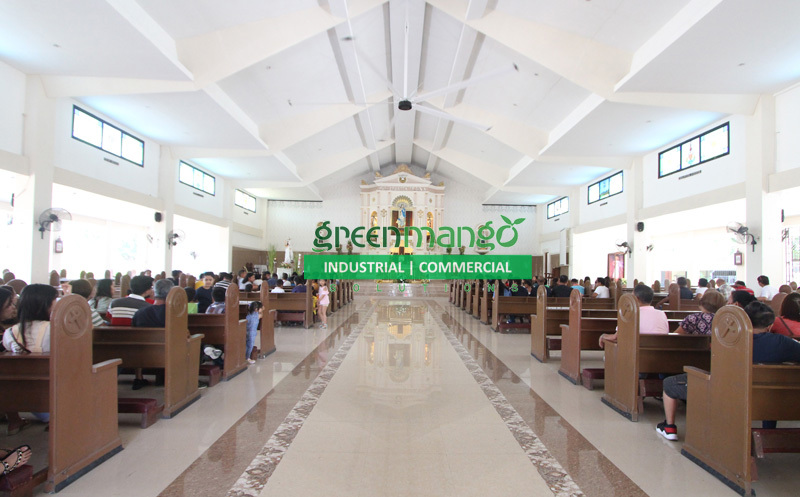 © 2018 GreenMango Solutions. All Rights Reserved. 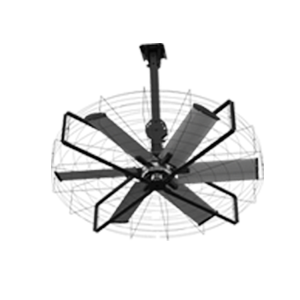 High-volume low-speed (HVLS) fans move at low rotational speed but can move large amounts or air. They are often used to supplement air conditioning systems since they provide a stronger cooling effect while helping to maintain constant temperature and humidity.